Delicious Stir-Fry dishes in 15 minutes! Stir-fries are quick, but they don’t have to be basic. 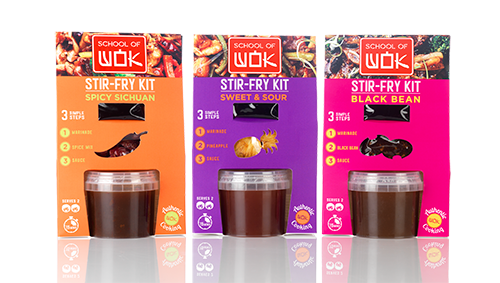 School of Wok’s new Stir-Fry Kits combine specially-sourced ingredients with award-winning cookery school expertise to produce a meal-kit like no other. Serving two people and ready in only 15 minutes, each stir-fry is quick and easy to produce, but still retains the quintessential flavour of each delicious Chinese dish - making sure that this supermarket stir-fry gives you an authentic Chinese experience, right in the comfort of your own home! They work in threes: coming in three flavours, providing three expertly prepared pre-made ingredients, and leading chefs through three simple steps to stir-fry. Explore our fantastic flavour options below, then pick up a pack from your local supermarket - and #BecomeAWokstar today! Sweet and Sour: A take-away classic, reimagined. Using dehydrated pineapple for a hint of natural sweetness and rice vinegar to pack a punch of sour, we’ve also added soy, garlic and chilli to create a diverse flavour base beneath the dominant sweet and sour. This traditional method of layering of ingredients adds a depth of flavour to the dish - making its taste that much more longer-lasting, and definitely more more-ish! Black Bean: Along with a marinade and sauce, this pack includes the traditional Chinese ‘douchi’ - more commonly known as ‘black beans’. Entirely unrelated to the American black turtle bean, Chinese ‘black beans’ are actually salted black soybeans, and when combined with ginger and garlic in our sauce, they produce a mouthwateringly savoury flavour that defines a simple stir-fry. Spicy Sichuan: Ideal for those who like it hot! Including the terrifically tingling and mouth-numbing Sichuanese peppercorns alongside fiery red chillies, our Spicy Sichuan spice mix gives you the explosive hot-cold experience of an authentic Sichuanese stir-fry, no matter how many miles away you may be! We'll get back to you within 1 working day - but usually sooner.